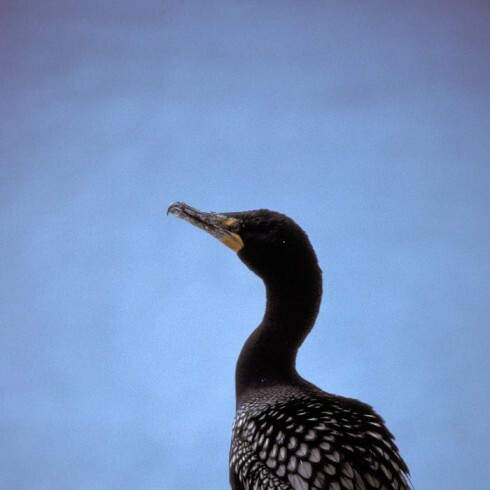 Quick update to crow (ha ha) about the newest addition to our list: Double-crested Cormorant. Dino spotted said water bird as he crossed the bridge over the Chowchilla last week on his way back from a town trip. Weekend before last, Dino looked out the kitchen window and spotted a Roadrunner in the front yard. It spent several minutes exploring the area just above the front garden fence until it finally headed down to the creek. I hadn't seen a roadrunner around here before - I've seen them in the desert in Southern California - and have harbored jealous thoughts of everyone here who has seen them. The same bird returned around supper time to scavenge around the front garden area. I saw it again Sunday morning and watched it as it lurked underneath the hummingbird feeders and seemed to be calculating how high and fast a leap would be required to snag one. Evidently, it decided that the whole operation would be a waste of energy because it didn't try. The tail on the roadrunner was longer than the actual body of the bird. I felt so excited and interested by this that I sang the Roadrunner cartoon theme song (aloud a couple of times) and said Meep meep! at random moments, causing mild eye rolling on the part of my wonderful spouse. When I played the aforementioned song, Dino grumbled something or other about "unmitigated violence against canines." 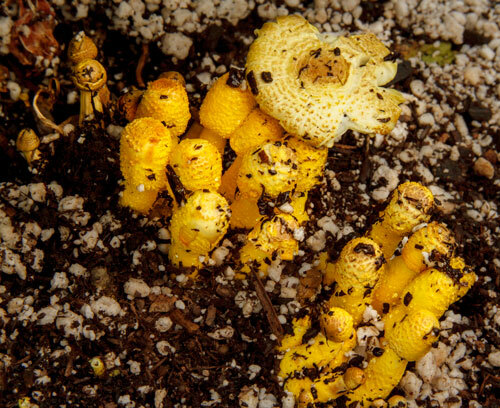 Then to really make the day special, I found a present underneath one of the bell pepper plants when I went up to the vegetable garden to water: a big clump of yellow mushrooms! 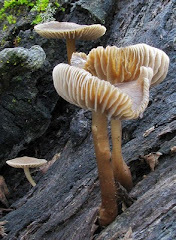 Fungus in California in August! Granted, it sprouted in a well-watered vegetable garden but I delayed not a bit in getting my camera gear set up. I've taken photos of this species before; I believe it's Lepiota lutea, a fungus commonly found in gardens. I suspect the spores came from the compost I dug into the bed before I planted this year. This photo shows them before they'd opened up their caps; they were fully unfurled when I checked them after supper. My ride to work last Thursday morning turned out to be interesting. I'd gotten about a quarter of the way up the big grade (the paved area) but had to stop because I found an SUV stopped and blocking the road. Turns out, he'd stopped because someone had driven their Jeep off the side of the steep grade and plowed it into an oak tree. It had landed about 10 feet down, and thank goodness for the tree or it would have been a much bigger drop. Neither one of us could tell if anyone was still in it. We pondered how to get down to check. I'm not exactly unacquainted with steep hills, although it's not what I'm fond of particularly, and I headed down. I wasn't dressed for it but what the hell. Actually, I had on a cotton polo shirt dress and my battered slip on mule/clogs whatever you call them. (Good gate opening footwear). The right windows had that dark window covering on them so I couldn't see in and I did my best to scoot around to look through the front windshield, but didn't see or hear anyone. The engine was just barely still warm, so whatever happened had been some time before. The way the vehicle was listing downhill made me decide not to go to the driver's side door as getting crushed was not on my agenda for the day. I climbed back up and the neighbor decided to drive about a mile further up at the big hairpin where I've gotten a cell phone signal in the past to call it in to the sheriff. Cell phone reception is the absolute pits there, you have no idea. By some miracle, he got through and he waved me on so I could get to work. By the time I was making the homeward trek in the afternoon, the Jeep had been yanked out and parked at the bottom of the grade. That must have been an interesting task for the tow truck driver, although I expect it wouldn't have been the first time someone's gone over an edge. I realized when I woke up the next morning that I should have had one other consideration in mind when it came to washing up after my little downhill excursion. That is to say, I have a couple of monster poison oak rashes now on my arms and legs and isn't it lucky that it's the middle of August when the damn stuff is at its lowest ebb or I'd be even more of a mess. Dumb of me, I know.